Mitch goes through a prodigious amount of paper, so when I heard about the re-usable Rocketbook I was immediately hooked. Maybe this will finally clear my kitchen table of endless piles of silly drawings! The concept is pretty simple…at least from the user end! The Rocketbook Everlast is made of a special waterproof synthetic “paper” that works hand-in-hand with the Pilot FriXion erasable pen. This is the ONLY kind of pen that erases nicely from the page–but not to worry, you can find them anywhere pens are sold. I found more pens at Walmart, but you can also find pens online and toss them in your Amazon cart. Search Amazon you’ll also find FriXion highlighters and markers! You can easily erase your writing with either the FriXion’s eraser*, or with a damp cloth. The book comes with a microfiber cloth that perfect for the job, but anything will do. You can even lick your finger and rub it off…or not if that’s kinda gross. The ink is smudge proof and dries in a few seconds. That’s probably the only fault I found–if you make a mistake you can’t IMMEDIATELY erase it cleanly. But just wait 10 seconds and you’re good. Rocketbook did some testing and found that pages erase cleanly EVEN if the ink stays on for a month or two. So there’s no need to worry about archiving your work right away. When the ink stays on for longer than 2 months, there was slight ghosting on the page. But it’s really faint and the paper still works! *Rocketbook doesn’t recommend heavy use of the pen’s eraser–you could rub the coating off the page if you get to aggressive. A reusable notebook is pretty cool, but heck…we already have wipe boards! So what’s the big deal, huh? What takes the Rocketbook to the next level is the companion app. You can download their app from iTunes or Google Play for free and whoosh! all your handwriting is digitized. The app is very simple to use, just point your phone’s camera at the page and line it up until the page turns yellow. The camera will automatically snap a picture–no buttons to push! You can scan several pages at once, or just one at a time. Bonus–you don’t even have to line it up perfectly! Want to test out a RocketBook RIGHT NOW??? 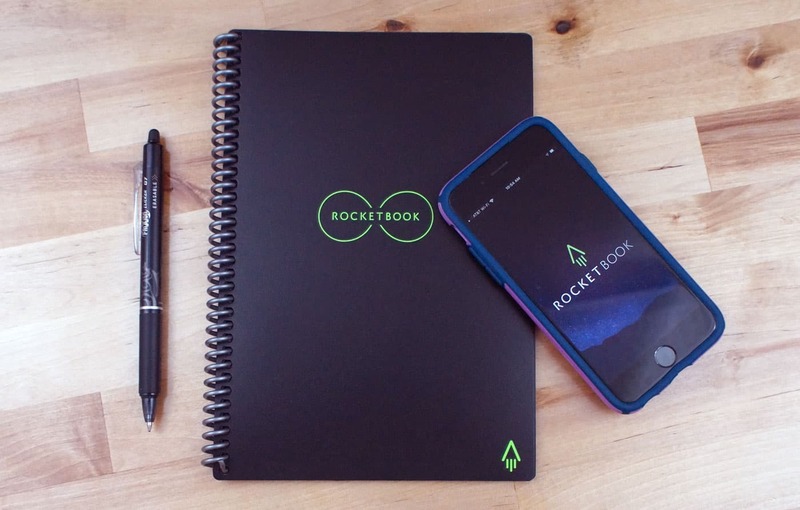 You’re welcome to download the app then grab a couple free pages from RocketBook’s website! The pages aren’t reusable — duh, you printed them — but you can see how the computer side of the system works!